A soil is made up of three types of soil particles: sand, silt and clay. Each of these particles plays a vital role in the success of the infield skin. In order for the soil to provide ample support for athletic play, it will need to have the proper density of particles to fully stabilize the soil surface. This jar represents an infield soil profile. Blue and purple particles indicate variations of sand, yellow silt, and the red haze indicates all kinds of tiny little clay particles. The proper amount of each size particles creates structural stability in an infield’s soil. SAND — It’s function in the infield soil is to provide the structural stability. When sand is present in proper amounts and sizes, it creates “pore space” or “air space” which leaves room for the smaller particles of silt and clay. Because of its large particle size, sand should take up the majority of the volume in your infield soil. Sand is usually divided into five sizes ranging from very fine to very coarse. 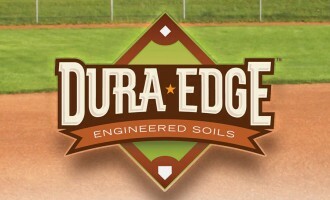 For infield soils the majority of the sand should be in the medium to very coarse range. An infield soil with the proper volume and sizes of sand will easily support athletic traffic on the surface — even in wet conditions. Conversely, infield soils with large volumes of fine and very fine sand will lack stability. SILT — This is the soil particle that is sized between sand particles (larger) and clay particles (smaller). Because of this, silt helps to bind sand and clay particles together in a mix. However, excess silt can cause many problems on an infield ranging from a greasy surface when wet to a very dusty infield when the soil is dry. How much silt is needed? The ideal silt content is a ratio which is equal to or ½ the clay content. Reference the SCR Scale below for the proper Silt-to-Clay Ratio. CLAY — Represents the smallest particle size in an infield soil and it provides color and moisture retention. In general, higher clay content in a mix requires more maintenance. How much clay is needed? The ideal clay content is a ratio which is equal to or 1 ½ times the silt content. Reference the SCR Scale below for the proper Silt-to-Clay Ratio. The Silt-to-Clay Ratio: This number is arrived at by taking the percent silt reported in a soil test and dividing it by the percent clay from the test. Use this SCR Scale to judge how this entity of your infield soil measures up. As mentioned above regarding clay content, the ideal SCR range for any infield soil is between 0.5 and 1.0, as indicated in green in the SCR Scale. When the SCR is between 1.0 and 2.0 — the “elevated” range — these fields can usually be fixed by merely placing a topdressing on the infield skin. Typically, a topdressing will address these elevated SCR problems in the soil if they are managed properly. Soils with an SCR of around 2.0 or higher will definitely need to be amended to adjust the SCR closer to the desired level. Overall sand content and sand size distribution will need to be adjusted as well in these fields. High SCR infield soils typically will be very slippery or greasy when wet, and very dusty when dry. Both of these conditions are due to excessive silt content in the infield soil. From Beacon’s infield soil testing experience, we have found that most of the infield soils tested had a high to excessive SCR, especially in the eastern half of the Unite States. These fields typically are very high in silt and sometimes high in fine and very fine sand content as well. That combination of high SCRs and high fine to very fine sand content results in some very unstable infield soils when wet. Infield soils that have a low SCR do occur, but not very often. Low SCR fields will typically suffer from either being too loose and sandy or they could have too high a clay content which will cause chunking-out on the infield skin.